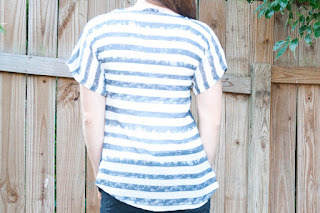 Very Homemade: DIY Anthropology Tee. I just finished up a top that I am just crazy for. The inspiration for this top came from this lovely number at Anthropology.com. 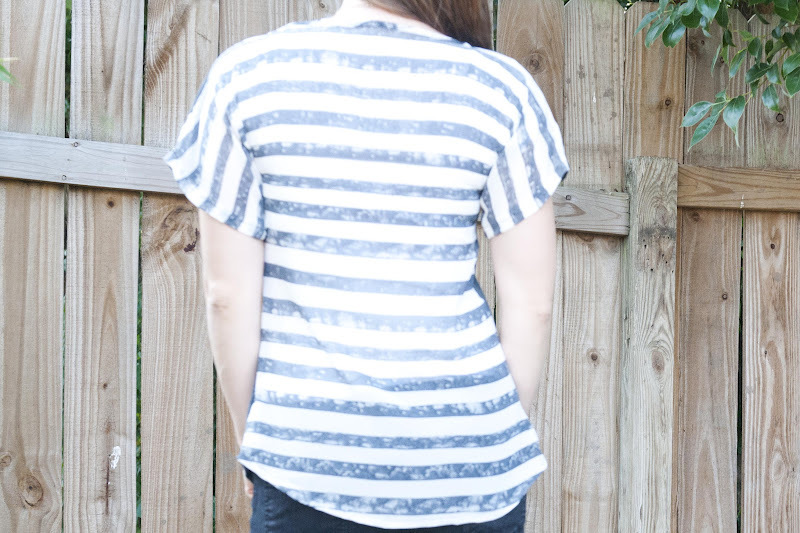 The Starred Chiffon Tee, $88. 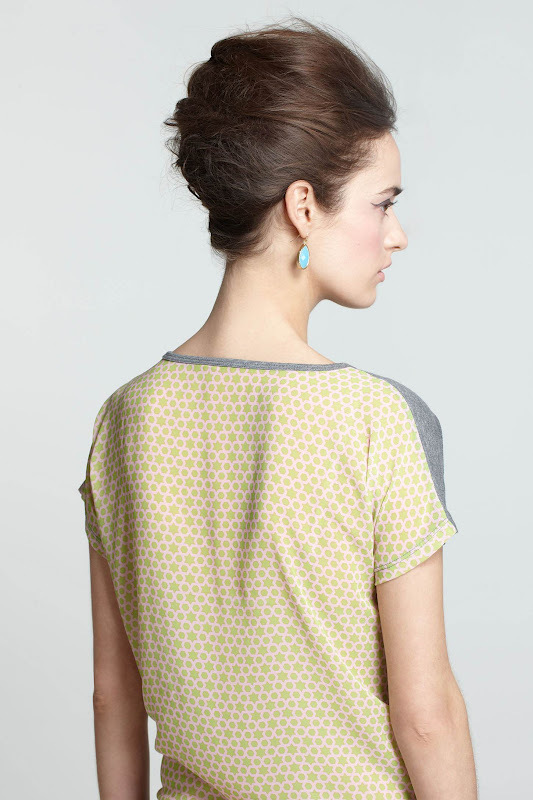 I adore that it is a super simple tee in the front with a very feminine surprise in the back. Very well designed. I just love it, but with the low reviews (reviewers say it was waaay too big) coupled with the price, I just couldn't bring myself to purchase. So I made my own out of an old t shirt and some chiffon fabric. This shirt is so comfy, and spices up my day to day wardrobe perfectly. Paired with some skinnies and some flats, I'm good to go. 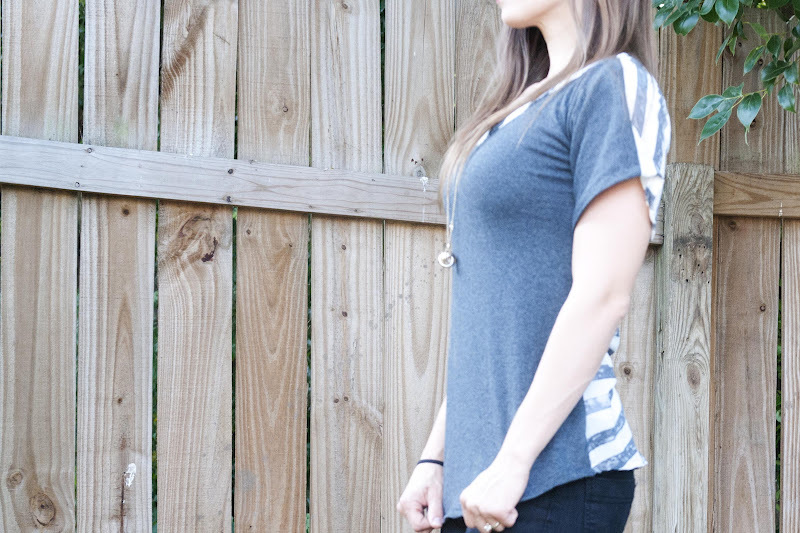 The dolman style sleeves makes this super quick and pain free. Ready to make your own? I'll show you how..
Just click below to expand the entire tutorial and to see this top dressed up. Big tee shirt (Men's XL or larger) with minimal design on it. 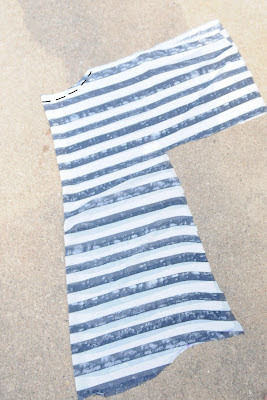 First, you will want to cut down the middle of the front of your t shirt (length wise) to make one big piece of fabric. Here's mine cut open, and laying flat as possible. Time to mark and cut out our shirt. 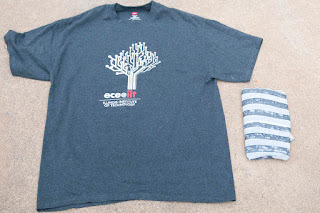 Place the shirt that fits you on the big tee shirt like the picture below. I put the top of my fitted shirt on the bottom of the big tee to maximize my fabric. 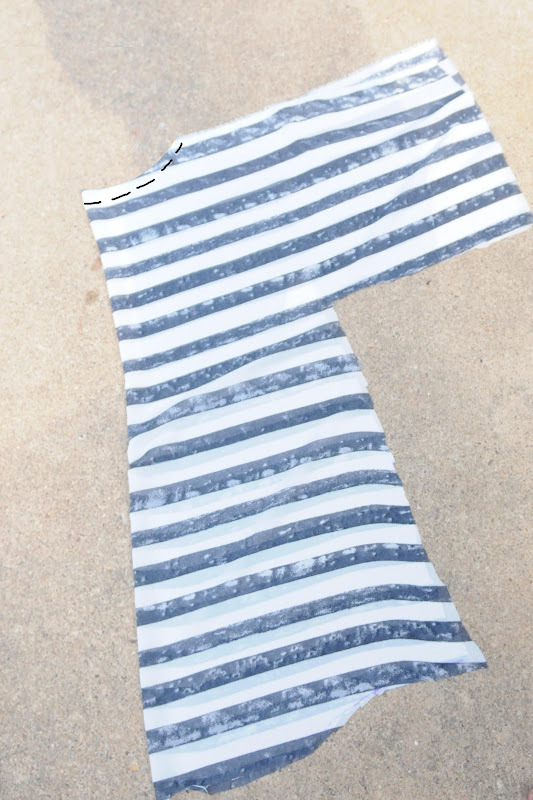 Using what you just cut out as a guide, cut out your chiffon fabric. Now, we'll cut out the neckline of your shirt. Fold your front fabric in half lengthwise. 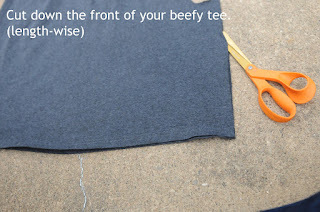 Do the same for your fitted shirt. Use your fitted shirt as a guide and mark the neckline on your fabric. 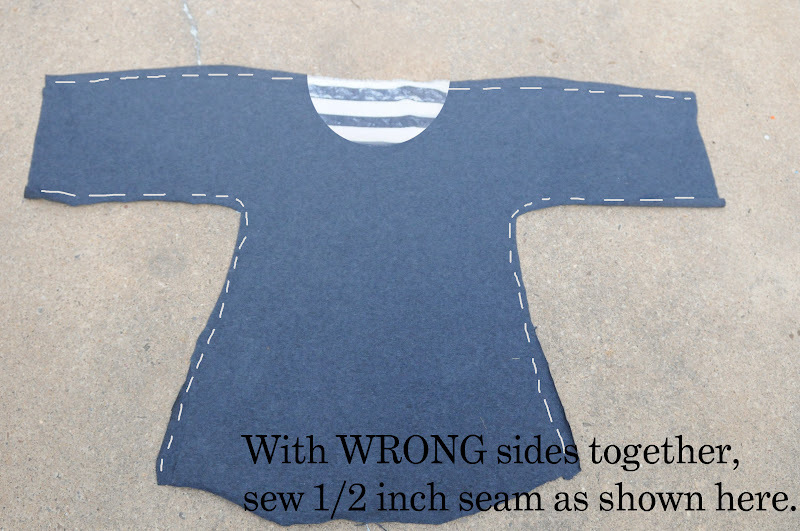 With WRONG sides together, Sew 1/2 inch seam on the shoulder seams and the side seams that you just pinned. 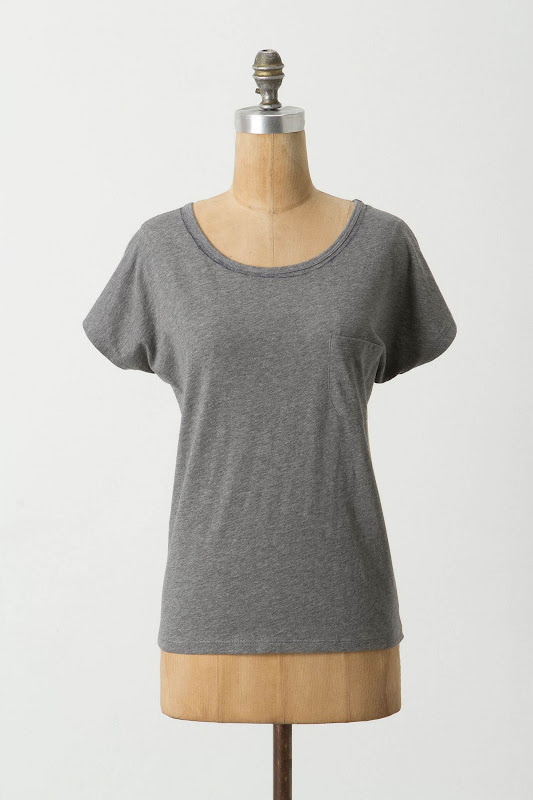 (Remember, the side seam extends to the underarm seam as well). Trim your seam allowances to be 1/4 of an inch or a tad less. 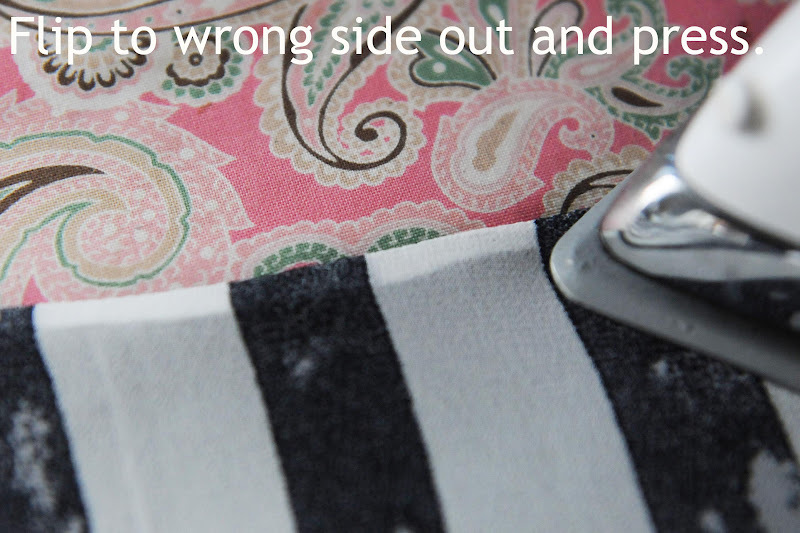 Flip your shirt so that right sides are together. (Shirt will be inside out). Press all seams. Now with RIGHT SIDES TOGETHER, sew all your seams again (shoulder and side seams), using a 1/2 or 3/4 of an inch seam allowance. You want to make sure you are encasing all the raw edges of your fabric. Hooray! You just made a lovely French Seam. You're almost done! Time to finish the neckline. 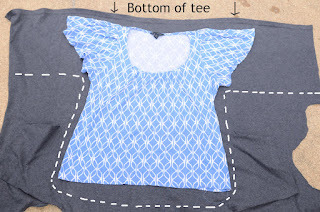 To give the neckline a nice finish, you will add a bias strip around the neckline. 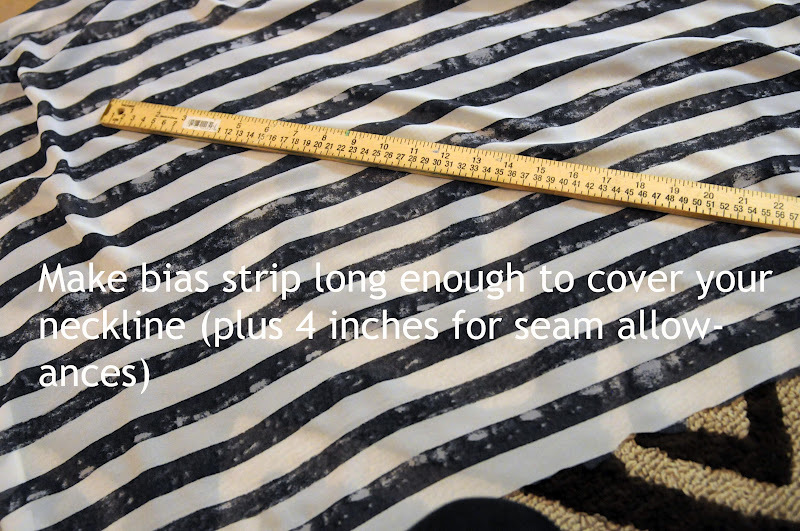 So we'll make a bias strip that is long enough to cover your neckline (plus 4 inches for seam allowances). 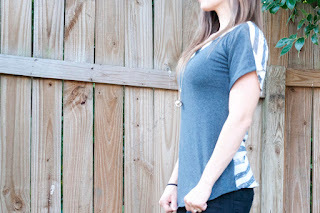 Measure how many inches your neckline on your shirt is around. (Mine was 20 inches). Add four inches to your neckline length. This is how long you want your bias strip to be (mine was 24 inches). The bias strip should be 2 inches wide. Make sure to measure and cut your bias strip on the bias (I usually just cut it a 45 degree angle from the edge) Using a ruler, draw a rectangle that is that is the length you just figured out by two inches wide. Mine was 24 inches by 2 inches. 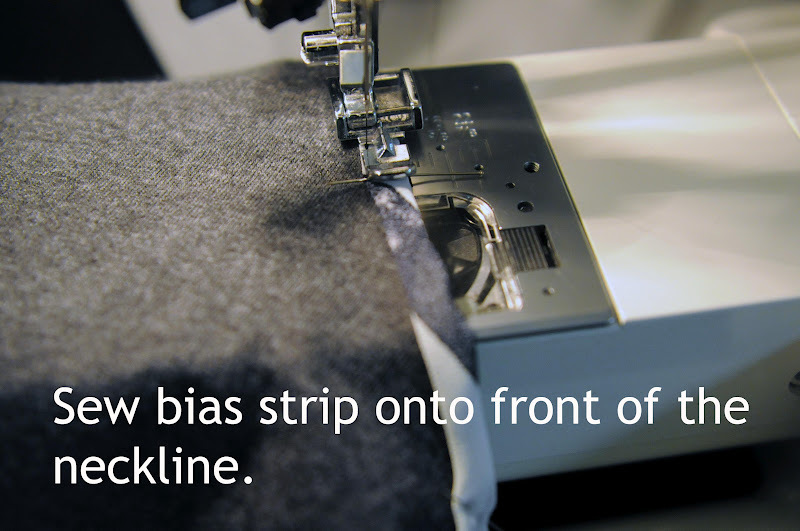 Fold your bias strip in half, length wise and press. 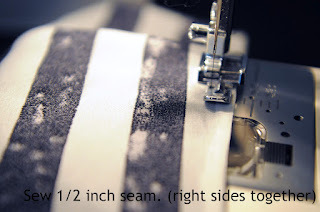 When folded, You should have a long bias strip that is 1 inch wide. Make sure your shirt is still turned inside out. 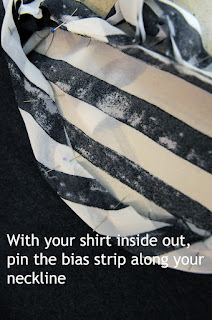 Leaving 2 inches of bias strip at the beginning unpinned, pin the bias strip to your shirt with the raw edge of your bias strip touching the raw edge of your neckline. I did it the lazy and incorrect way.. 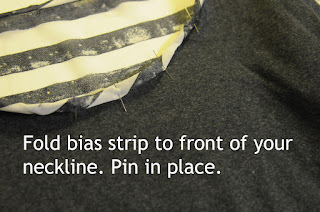 Here's how..
After I pinned my bias strip on, I measure where the two ends should meet, and I mark that on both ends. 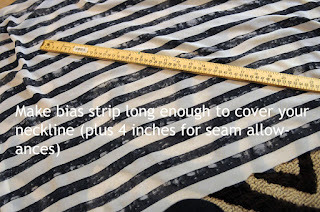 Sew or serge your bias strip to the neckline using a 1/4 inch seam allowance. Turn your shirt right side out. 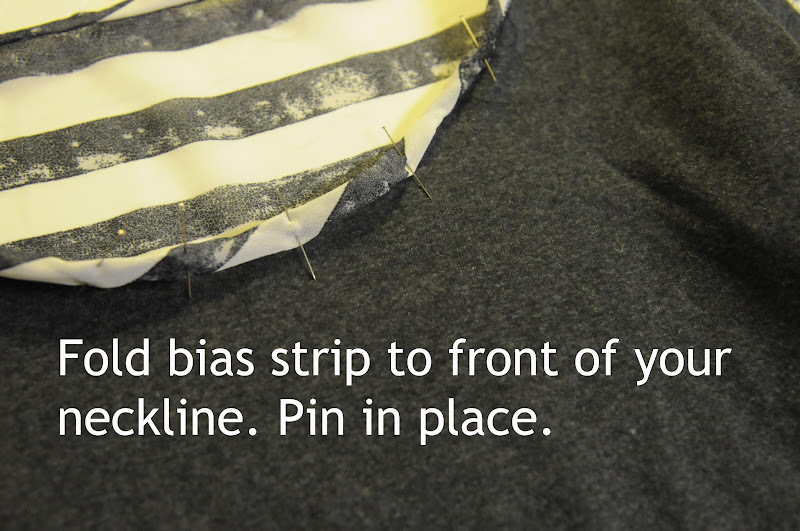 Fold your bias strip over to the front of the neckline. Pin in place. Still with your shirt right side out, sew your bias strip onto your neckline; sew as close to the edge of your bias strip as you can. Done with the neckline! Let's finish up. 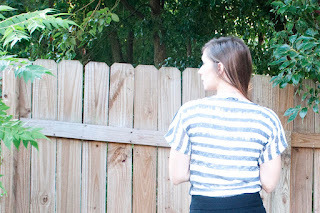 Trim your sleeves to your desired length. 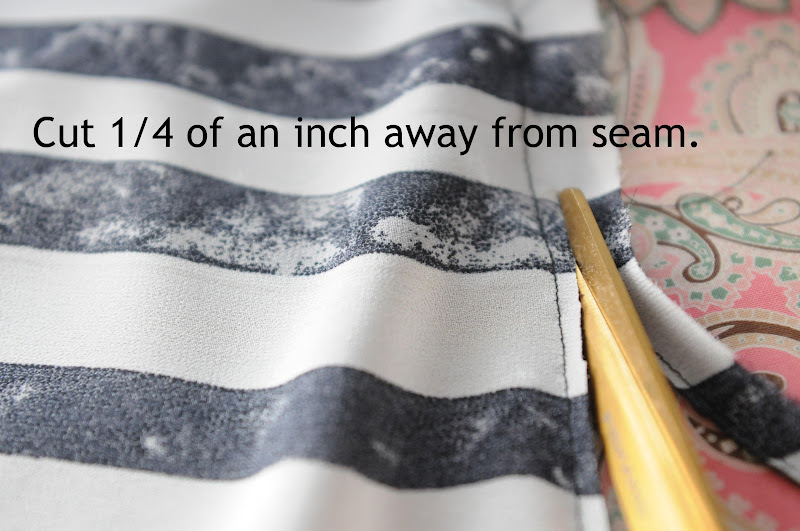 With your shirt inside out, Fold the raw edge of your sleeve opening down 1/4 of an inch. Press. Fold over another 1/2 inch and press. Pin the hem in place. Do the same for your bottom of your shirt. Fold fabric 1/4 inch down. Press. Fold another 1/2 inch down. Press. Pin the hem in place. 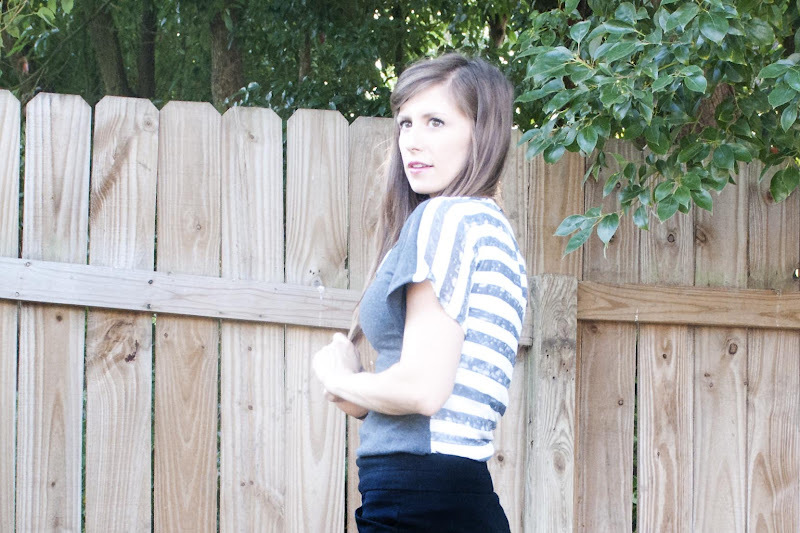 Sew both the sleeve hem and the bottom of your shirt hem down. Dressed up or dressed down, it's my new favorite tee. This is so cool! Thank you for such a great tutorial. I'm definitely giving this shirt revamp a try.